Community service can be defined as voluntary service intended to help people in a particular area. 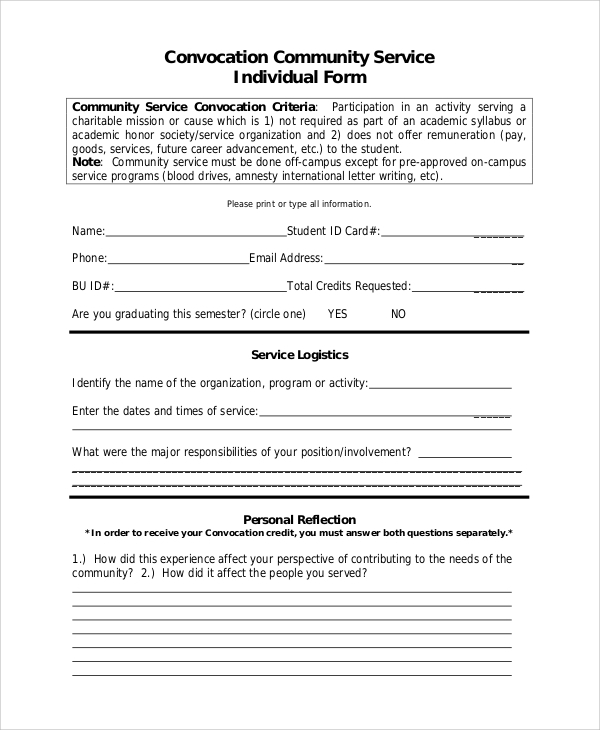 Community service forms are filled before or after the completion of such services, with the purpose of being attached to the resume. Sample customer service representative includes resumes containing community service experiences, which are needed on humanitarian grounds. 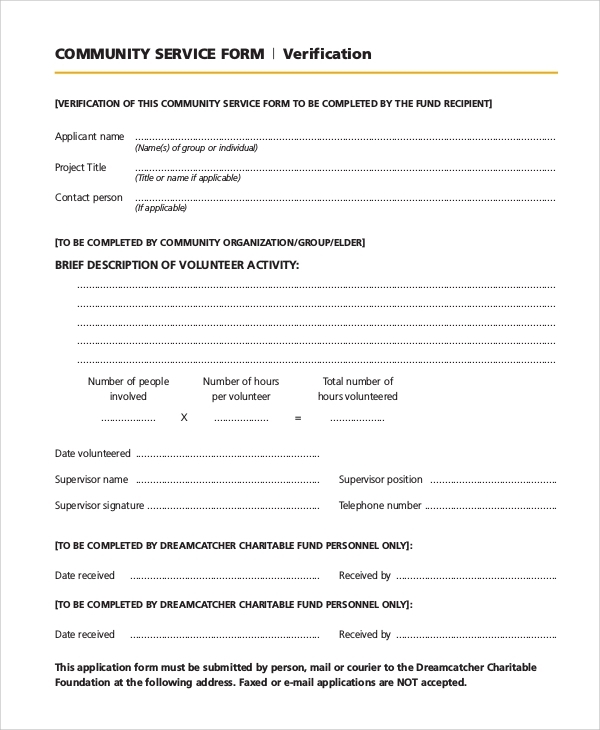 These Sample Forms are also required for receiving special permission to apply to volunteer at unlikely places, providing benefits for job applications. It gives detailed information on what community service, why they are useful, and what their benefits are. 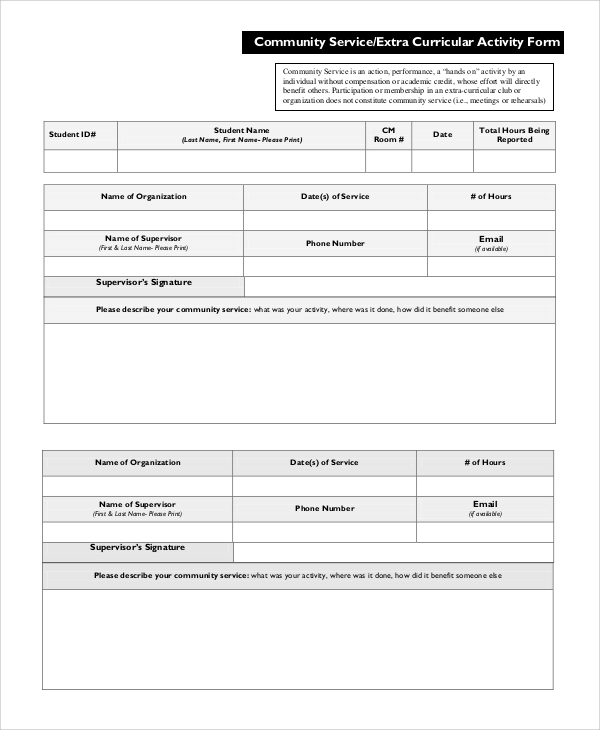 It asks for the name, date, activity, hours, place of service and signature. 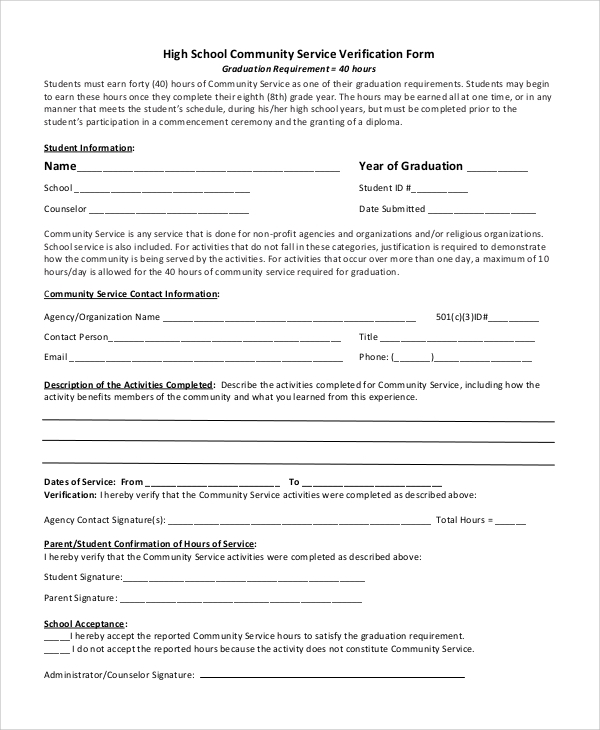 It defines community services, followed by student details, the name of the organization, date, the number of hours, the name of supervisor, phone number, and email id. Description about the experience is also needed to be provided. 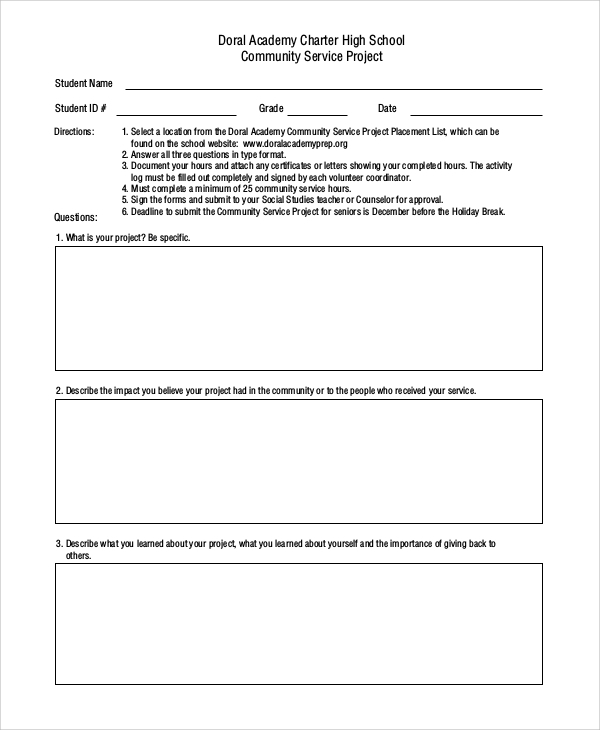 It defines requirements, and asks for applicant name, project title, contact information, description of volunteering activity, date, a number of people and hours and total hours volunteered, supervisor’s details, acknowledgment, etc. You can also see the Income Verification Forms. 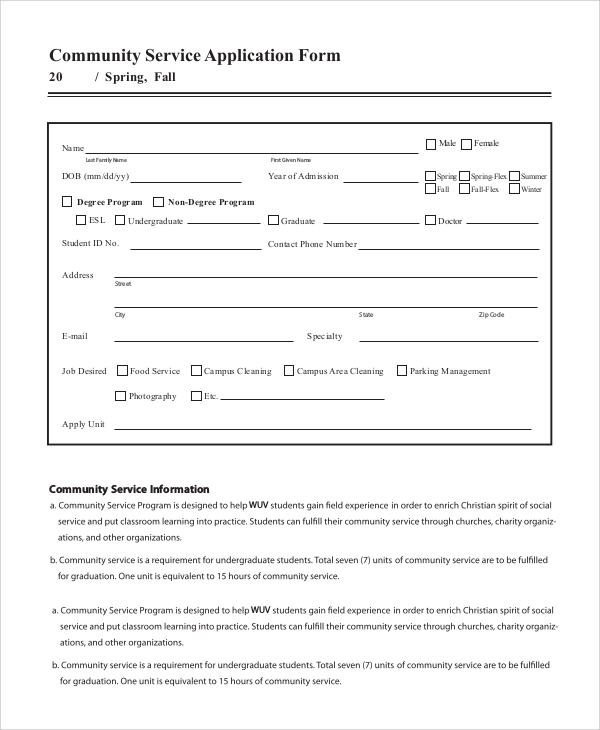 What are the benefits of these Community Service Form Samples? Community services save resources and help one to gain professional experience and strengthen the growth of your self-esteem and your community. Through these activities, you get to learn a lot, and participation in such civic activities also gives you a chance to return something to the society. You can also see the Sample Purchase Order Forms. It is crucial from both, a social and a professional point of view. Starting with a job to college applications, community services add points to your resume anywhere you go. The forms are very essential, because, not only do they keep track of your services, but they also provide legal permission to do such services. 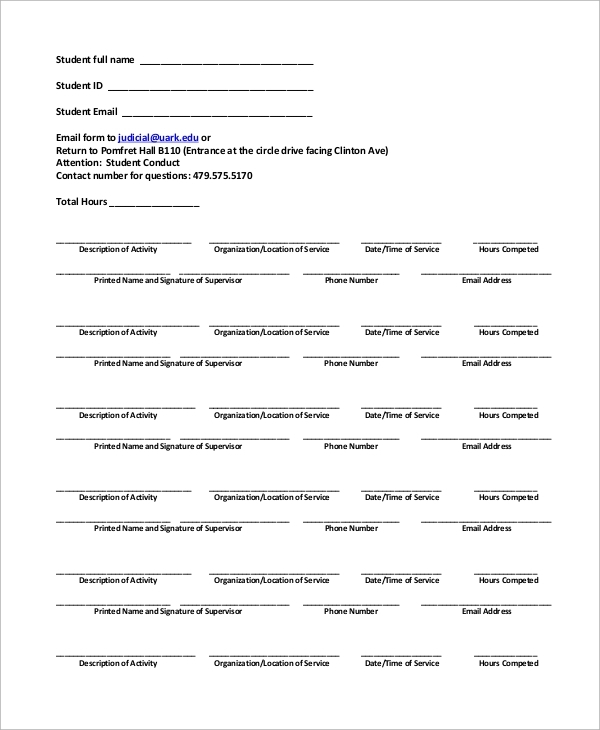 It asks for student details, followed by directions, and some questions, and signatures. 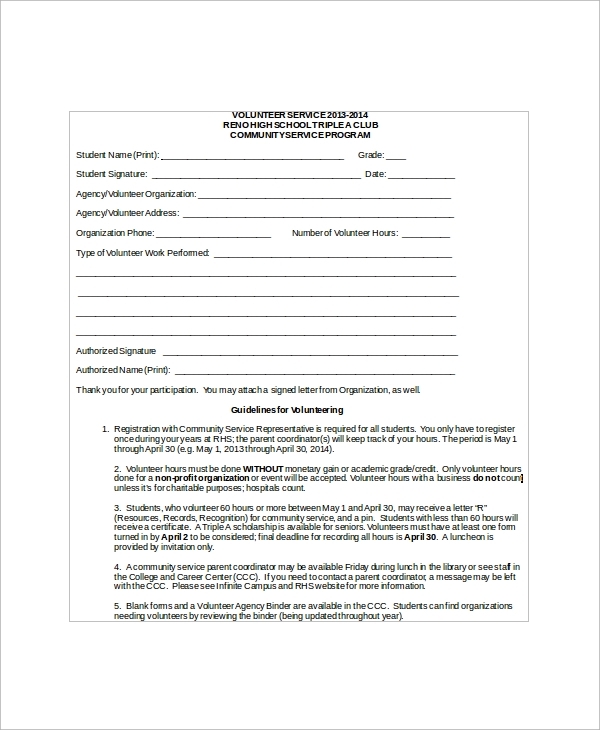 It also asks for details on date, activities, supervisors and coordinator signature, total hours completed. 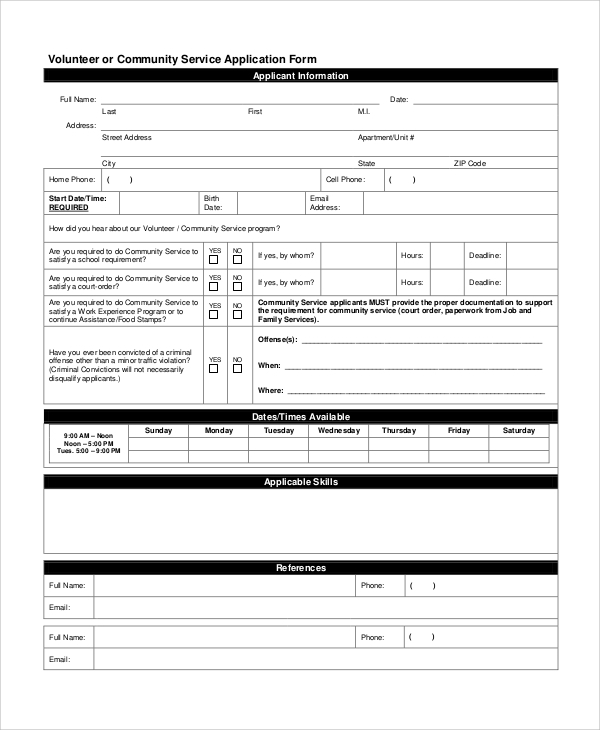 This form asks for details of the applicant, followed by a set of questions, availability of date and time, skills, references, location, accommodation, contact information, liability, e-mail id, demographic information, etc. Who must do Community Services, and why? Community services must be done by one and all, with or without the advantage of any personal gain, because they are a means to give something back to the society and to feel good about one’s self. These services must essentially be done by school and college students because the mention of such services done brings in extra points to their curriculum vital. You can also see the Sample Rental Verification Forms. Volunteering also helps one to socialize more and helps one feel good about themselves by helping those in need. Community services are also essential in building up of a stronger community, which is close and well-knit. 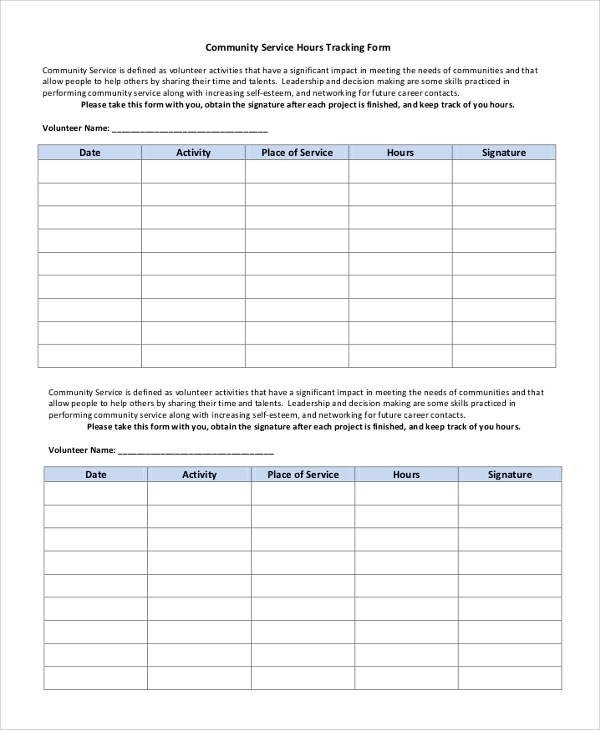 Community service forms are an essential part of volunteering experience, which are very advantageous. Customer Service Resume Examples, including mention of community service provided. These provide leverage while applying for college or any job. Community services help you strengthen you personally, and strengthen the community as a whole.